Side b: What would your mother say ! Fine powerpop/pubrock on this platter. I can't locate from where the band was. You have any ideas ? They were from Sheffield - UK, fanx for sharing, this platter is very hard to find! 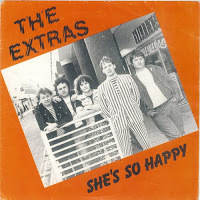 Tino's mixing them up: there was a band called The Extras from Sheffield, but this lot were from Carmarthen/Swansea. Um reupload here will be welcome, please, reupload. Link is off.